Diagonal Valley Rally is the special level of World 1 found in Yoshi's New Island. 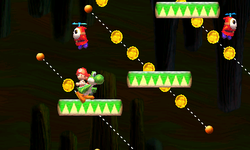 Yoshi starts the level in a cave-like area with a network of moving platforms and enemies. He should travel downwards and to the right using moving platforms until he eventually reaches the level's Goal Ring. This page was last edited on April 15, 2019, at 12:25.